It seems like everyone in Utah is mourning the loss of the two Powell boys, although most of us have never even met them. Just when you thought the story couldn't get any worse, it does. I've lost sleep just imagining what those poor, innocent boys went through. I had to go check on my two baby girls a few times in the night just so I could look at their beautiful sleeping faces and thank my heavenly father for sending them to me, for keeping them safe, and for blessing me with my sweet husband who would do anything to protect us. My heart goes out to the Cox family during this time of complete despair. 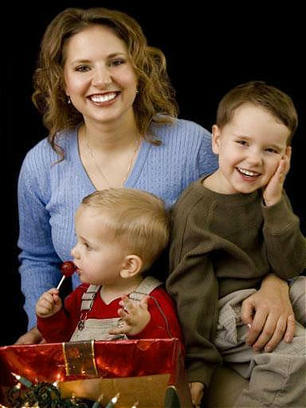 The final moments for Charlie and Braden must have been completely horrific, but I take comfort in knowing that they are now wrapped tightly in the arms of their mother. Yes, just knowing that they are with their Mommy and our Lord makes my heart hurt a little less. Sick people. I actually hadn't heard about this (living under a rock in Canada) and read about it on Wikipedia after seeing your post. As a former 911 Op, I cannot stand when screwed up people use their children to make their mental statements. Those poor precious babies and their mama...and for what? It makes me physically ill thinking about those babies and their last moments. I pray for the grandparents and family who loved those beautiful children. What kind of people are on this earth? Why must they take the innocent with them?? The little ones and their mother are with God now. The only comfort the family can get is knowing that all are with the Lord and he has taken away all of their pain. The pain will remain with the family; however, the Lord will wrap them tight too and allow them to feel his love and rejoice with the Lord that he now has their Angels. God bless. We here in Washington have also been horrified by the murder of those two innocent boys. The only consolation is knowing they have been reunited with their mother who was also taken before her time. My heart aches for them and for their grandparents. May Susan and her babies rest in peace.